The story of Tonya Harding as the first female figure skater to land a triple axel is inspiring, but it always gets lost or forgotten in the more chaotic and tumultuous tale of the infamous incident involving a rival skater’s kneecap. 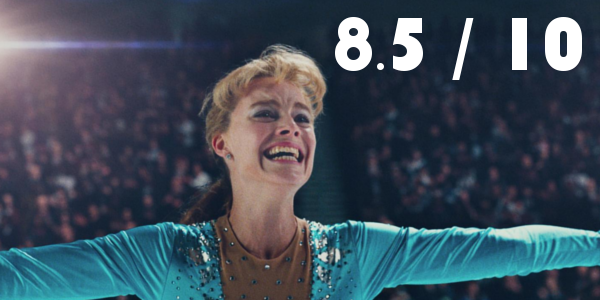 Of course, both sides of the coin are undoubtedly interesting, though when balanced together with a few of unreliable narrators, some fourth-wall breaking, and an equal dose of tragicomedy, I, Tonya becomes something that’s hard to look away from. Tonya Harding (Margot Robbie) rises through the ranks of competitive figure skating only to find disgrace when her husband (Sebastian Stan) tries to eliminate her rival. While the synopsis is certainly vague, the real-life story isn’t really more complicated than that. The structure of the film as an interview to camera, mockumentary style, however, allows for some comedic moments in the dramatic. So much so that it’s sometimes hard to believe that these events happened, or at least a version of them did (again it’s hard to know with the unreliable narrators steering the ship). A majority of these people, or characters, are not the best people though either. Tonya emerges as the best of them though part of that assumingly has to be credited to an excellent performance by Margot Robbie. The actress delivers a career defining level performance here that will surely earn her a place in award discussions everywhere. Robbie gets to flex her muscles in one scene in particular that might just grab her an Oscar nod on its own. Not to be outdone though is Allison Janney as the biting and cruel mother LaVona Harding. It helps that Janney gets to chew up and spit out some of the best bits of dialogue in the whole film, but it’s an absolutely great performance regardless. When looking for a textbook example of balancing tone, look no further than I, Tonya. This is not a happy story, the amount of pain that befalls Tonya throughout the film is immense and yet the director Craig Gillespie never lets the humorous side get too far away. It manages to humanize these people in a way, which sounds strange of course, but seeing this story play out has that effect. It is an effect that almost causes you to feel guilty for laughing, even though the film wants you to. Overall, I, Tonya is a film elevated by dynamite performances from Robbie and Janney, who are very likely to earn nominations all throughout the season. They’re backed by a fascinating story all wrapped in some twisted humor that makes for a terribly enjoyable film from start to finish, that never loses sight of the true emotional tragedy behind it all. So what did you think of I, Tonya? Have you seen it? Are you interested in seeing it? Share, subscribe, comment below, and as always return to I Am Sam for weekly reviews and insight.